Posted on February 23, 2018 by holly.obermeier@noaa.gov. We’re always making technological strides here at KPHI TV! This year we’ve upgraded to a green screen setup, including lights, camera and lapel microphones. Different from past years, we’ll be recruiting two broadcast meteorologists per week (versus one). 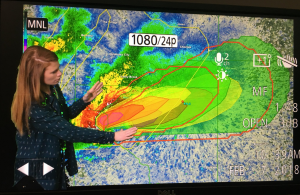 The two meteorologists will work in tandem in this new studio space to cover hazardous weather events using NSSL’s experimental PHI product in a research environment. Posted on February 13, 2018 by kodi.berry@noaa.gov. 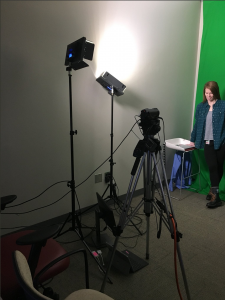 Welcome to KPHI TV, the fictitious news station affiliated with Probabilistic Hazard Information (PHI) project in NOAA’s Hazardous Weather Testbed.